On August 20th 2004, Liverpool completed the transfer of little-known Xabi Alonso from Real Sociedad in a deal worth £10.5 million. The deep-lying playmaker didn’t take long to settle in at Anfield and it rapidly became apparent that Rafa Benitez had signed a midfield metronome of ethereal quality. It is rare to pluck a player of such immense raw talent from one of Europe’s top five leagues at a price as modest as £10.5 million, but Liverpool managed to pull off one of the signings of the season in 2004 at that very price. Sitting at the base of Benitez’s midfield, Alonso conspired to regularly dissect his opponents with a level of vision which transcended beyond what the vast majority of top players are capable of. The equalising goal against AC Milan in the 2005 Champions League final will remain a cinematic moment of euphoria to replay through the ages, but it was the finesse and simplicity of his every movement on the pitch which will remain etched into the minds of the Anfield faithful. His classy style of play mirrored his outwardly slick yet unpretentious appearance. Benitez was the rotund Spanish waiter and Alonso was the chiselled Spanish prince. Javier Mascherano is the only defensive midfielder to arrive at the club since Alonso who has showcased anything like the sheer level of class the Spaniard displayed in boundless quantities. Jonjo Shelvey, Joe Allen, Alberto Aquilani, Raul Meireles, Emre Can and even Charlie Adam, who lacked the verve and charm Alonso possessed but offered a beer belly fit for a 20-pint bender on the Friday night preceding a Saturday fixture – so 1 nil to Adam I guess – have all been signed in the past ten years to settle into the midfield unit. All have them have been and gone, leaving little legacy behind. Michael Edwards, though, operated with a nous and determination that suggested Liverpool were striving to buck this trend last summer. The deal for Naby Keita was already in place and hype surrounding his arrival was ubiquitous throughout the entirety of the 2017/18 season, but then something unexpected happened when the summer arrived: Edwards also negotiated the deal to bring in Fabinho from Monaco. Out of the blue Fabinho was on his way to Merseyside in a £43.7 million deal. The Brazil international was hardly an unknown entity but the buzz over his signing was quashed somewhat by the overwhelming interest in Keita. Fast forward nearly twelve months and the narrative has unfolded in a manner which only a minute contingent of Liverpool fans and neutrals would have predicted: Fabinho has been the outstanding summer acquisition and Keita has fallen on the moon with supporters expecting him to reach the stars. Klopp has demanded patience from Fabinho with a steady introduction into the starting XI, but his stellar showing against Chelsea on Sunday afternoon proved that he is now a fundamental cog in Liverpool’s machine. 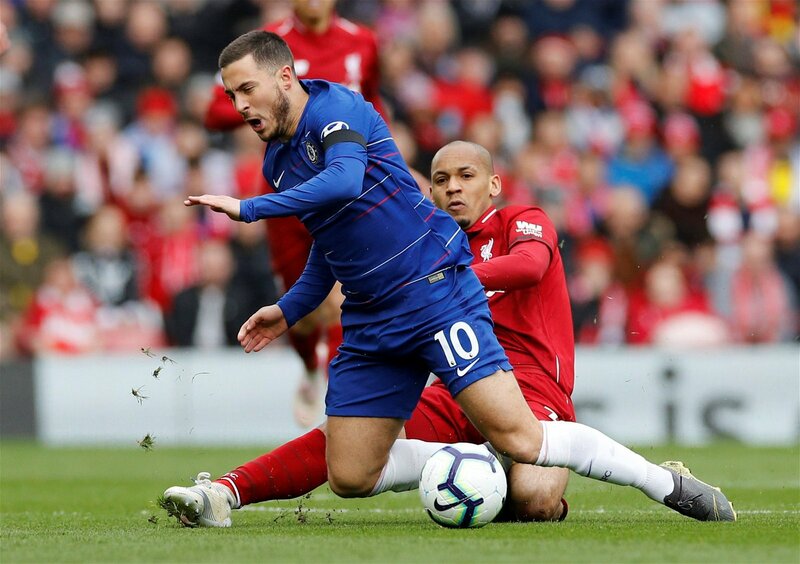 Domineering, creative, box-to-box, imperious and donning a clear nasty streak, as his questionable decision to clear his nose in the vicinity of an injured Eden Hazard attested to, Liverpool’s latest metronome was a joy to behold. He completed six dribbles in the game, per Whoscored, a personal record which doubled his previous best this season, crunched into four tackles, made a single interception and completed 87 passes – more than any other player on the pitch – in a performance which had shades of an Alonso-esque masterclass. It was the type of display which appeared to single-handedly vindicate Liverpool’s decision to swoop last summer, with every intelligent pass compelling the Anfield crowd to coo over this new majestic lynchpin. Liverpool’s sporting director has established himself as an immensely popular figure since he was appointed to the position in November 2016. His ability to secure a deal for Fabinho, though, might just be his most outstanding achievement yet. Those tasked with transfer policy have consistently failed to secure anything close to an adequate replacement for Alonso since he departed in 2009, however – even Mascherano lacked his orchestrative incisiveness in possession – Edwards seems to have finally achieved what none of his predecessors could manage. Perhaps there is something slightly more functional and less awe-inspiring about Fabinho in comparison with Alonso. His role depends less on the majestic diagonal passes Alonso effortlessly used to spray and more on the destructive qualities he possesses in the defensive shape. But make no mistake about it, it would be insulting to undermine the Fluminense academy graduate’s exceptional ball-playing abilities. Liverpool fans hadn’t seen anyone quite like Alonso in the past ten years until Fabinho rocked up last summer. After all these years, the Reds appear to have finally found the World Cup winner’s genuine successor.